Jackson Hole may be better known for the 30-plus feet of frozen water it gets each winter, but come spring and summer, a freely flowing version of the resource fills hundreds of miles of rivers and creeks and countless lakes and ponds. Early settlers to the area called the Snake River, the "Mad River." Furious and seemingly unnavigable whitewater 30 miles south of Jackson prevented the Snake from being used for transportation and commerce. Every ten years or so from the 1930s on, a person might have run the canyon, but these people were considered possessed, not pioneers. Higher up, towards the town of Wilson, people might fish in the river, but that was the extent of it. Today, river schools instruct kayakers and canoeists in the skills necessary to run these “unnavigable” canyon waters. 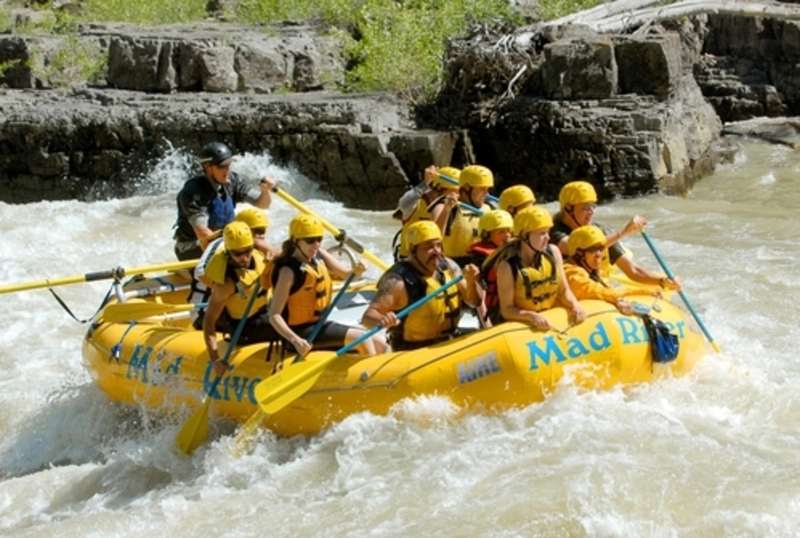 Whitewater guides safely take approximately 100,000 people down the Snake each summer. But you can do it without a guide too. Thanks to the Snake River Fund, there’s not even any user fee to do this. 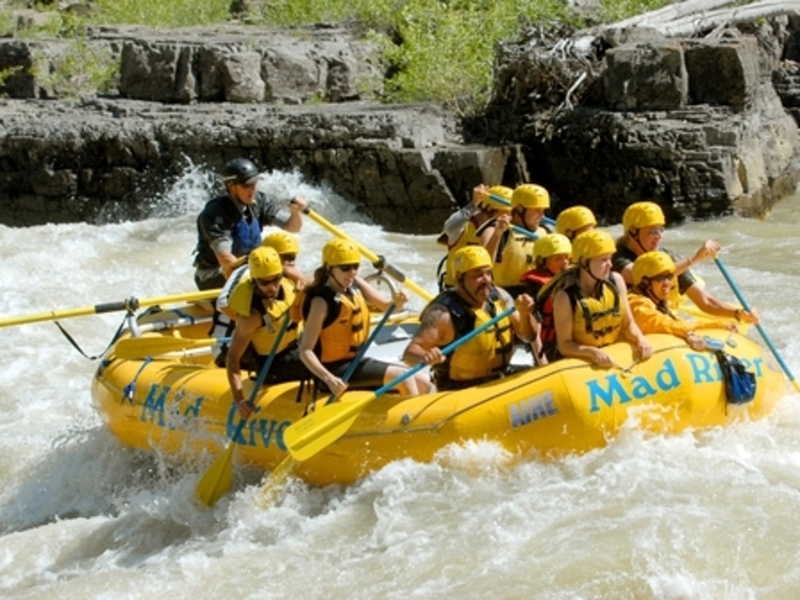 The eight-mile whitewater section of the Snake River Canyon from the West Table Boat Ramp (21 miles south of Jackson) to Sheep Gulch Boat Ramp is Class III. When the water is really high in the spring, it might be class IV. The biggest features along it are Taco Hole, Big Kahuna, Lunchcounter, Ropes, Champagne, and Cottonwood. Due to the nature of the river bottom, some of these rapids grow as flow increases and others get bigger with lower flows. This means there’s always fun to be had. The highest water usually happens the second to third week of June. If you just want to play in Taco Hole or Lunchcounter, there are pullouts along the highway with stairways down to the river. If you think you see surfers as you go through Lunchcounter, you’re not crazy. Surfers regularly hit that rapid, which is a standing wave. Surfers have been known—when it’s not crowded—to surf it for over an hour! Class III - Class IV rafters, and surfers, too! If you’re looking to do this with an outfitter, all of them--Barker-Ewing, Sands Whitewater, Mad River Boat Trips, Lewis & Clark River Expeditions, Dave Hansen Whitewater Trips, and the Snake River Park & KOA—all do the exact same stretch of water. All of these guiding companies have been operating for at least a decade and all of them, with the exception of the Snake River KOA, have meeting points in town. Also with the exception of the Snake River KOA, all of them cost about the same. Perhaps because you have to drive 10 miles south to Hoback Junction for Snake River KOA’s trips, these guys are approximately $10 cheaper than their competitors. In town, Mad River has a cool and informative whitewater museum in its building, near Smith’s supermarket.